As many Hindu parents in America and Canada [Images] know too well, you just cannot be prepared for all the questions your child has to face in the school. Questions like: Why do Hindus worship the cow? Are Hindu Gods always married to many women? Why do Hindus worship idols? And then there are endless questions about what Americans call the dot. Not to forget questions about the Hindu pantheon of gods. The parents' answers and explanations are often not satisfactory to the children -- or, for that matter, to the parents themselves. Often the parents ask someone in the community, who has commanding knowledge of Hinduism, for answers or seek the help of a Hindu scholar, or in libraries. Now, parents and children can turn to What is Hinduism? -- a landmark book with over 400 large pages and nearly 1,000 illustrations that answers the above questions, and many more, with brevity and clarity. One of the book's important achievements is in creating context that explains otherwise inexplicable Hindu practices. For instance, it connects social practices like untouchability to segregation practiced in America a few decades ago, and to the fact that there are millions in America including African Americans and Hispanics who face continual discrimination in residential areas, schools, at workplaces and in places of worship. These are the true 'untouchables,' the book writes. After telling the readers that it is illegal in India to discriminate against, abuse or insult anyone on the basis of caste, the book looks at modern America, adding that there is a class system in the United States that is very bad. 'US cities are more racially segregated than before the 1950s Civil Rights Movement because of white flight to the suburbs,' the book notes. 'Black Americans receive harsher sentences than white Americans for the same crime.' It goes on to write a few lines on the plight of Native Americans too. Are Hindus forbidden to eat meat, is another question immigrant Indians often face. The book does not point out that in most regions of India the majority of Hindus eat meat and fish, and it does not reveal that Bengali Brahmins eat fish religiously, and that Swami Vivekananda continued eating fish even after he had become a monk or even that the Buddhist spiritual leader the Dalai Lama [Images] is a non-vegetarian. The book offers a wealth of information on various aspects of Hinduism, from the devotional to cultural to epicurean. Published by the Himalayan Academy in Kauai, Hawaii, the book is based on hundreds of articles published in the magazine over the past 25 years. The academy, which also produces the erudite and popular Hinduism Today magazine, is part of the Hindu monastery founded by Sivaya Subramuniyaswami, popularly known as Gurudeva, more than five decades ago. Though the Kauai monastery is a Saivite institution, the book deals with various Hindu traditions and offers the kind of insights not often found in other books of its kind. In one of the important chapters in the book, Comparing the Four Major Denominations, Saivisim, Shaktism. Vaishnavism, and Smartism, the authors assert there are more similarities, including the importance of temple worship and the concept of liberation of the soul from rebirth, than differences between the four denominations. But the book also explains some of the key differences between them. Saivite Hindus do not believe in earthly incarnations of the Supreme Being; the Divine Mother incarnate in this world is the belief of Shatki followers. Vaishnavism believes that Vishnu has ten or more incarnations. And the Smarta followers believe all deities assume earthly incarnations. The subject of idol worship is a big issue in America, where many fundamentalist Christians rebuke Hindus calling them idol worshippers. In school text books and in social science classes, Hindu children are often faced with opprobrium on such lines. As for the question about 'graven images,' the book says all religions 'have their symbols of holiness through which the sacred flows into the mundane': The Christian cross or statues of Mary, the holy Kaaba in Mecca, the Sikh Adi Granth enshrined in the Golden Temple in Amritsar [Images]. 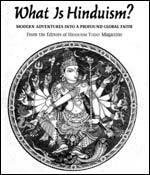 The editors of What is Hinduism? say that some people in other faiths criticise the Hindu religion as a sort of comic book religion. 'We should not be part of perpetuating that image by passing on such misconceptions as the marriage of the Gods,' the editors note. One of the highlights of the book is the reproduction of Swami Vivekananda's Song of the Sanyasin, which is spread across two pages, along with the picture of Vivekananda and the image of Thousand Island Park, New York, where the visiting monk composed the song. 'There is but One: the Free, the Knower, Self. Without a name, without a form or stain. In Him is maya, dreaming all this dream.. The Witness, He appears as nature, soul.